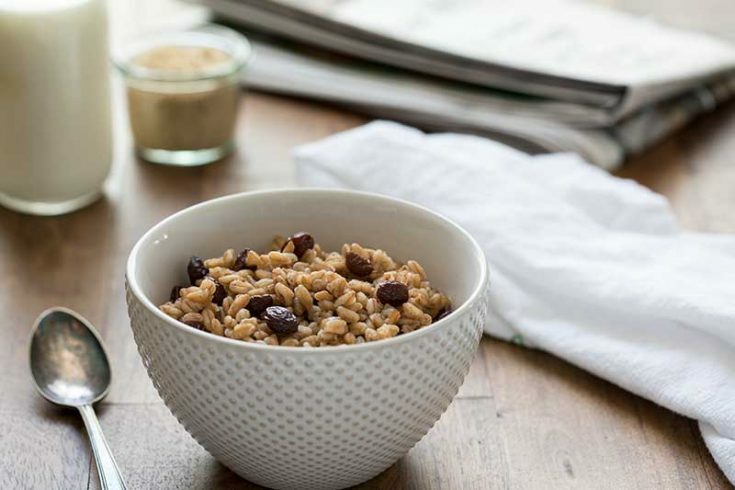 Start your day with this Pressure Cooker Brown Sugar Raisin Breakfast Farro and it will keep you satisfied all morning long. Have you tried farro yet? Farro is an ancient wheat grain. It has a nutty flavor, is a little bit chewy, and can be used as a substitute for pasta or rice. Popsugar did a great article, The Next Super Grain You Should Be Eating, explaining it’s benefits. An Instant Pot is one of the most popular brands of electric pressure cookers. 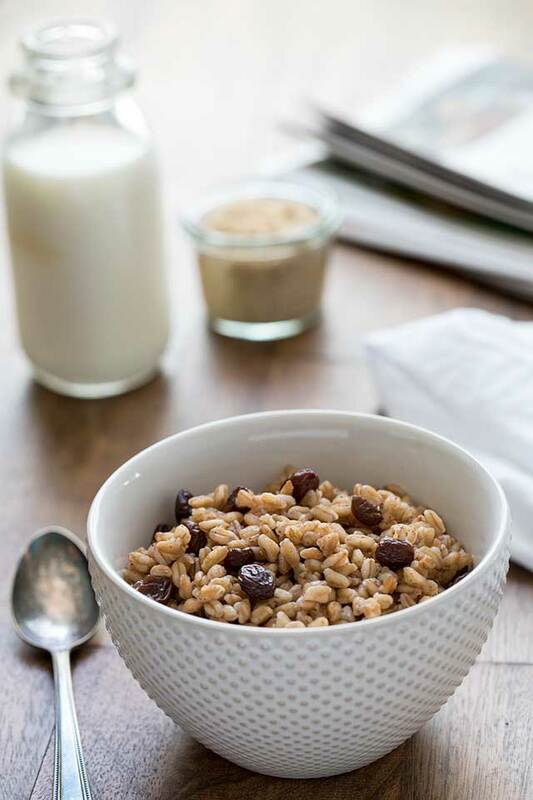 They are easy to use and your Instant Pot can help you create this delicious Brown Sugar Raisin Breakfast Farro ! My body seems to crave carbs in the morning, so I was looking for a way to change up my cereal habit with something besides oats. Farro is a great choice because it’s loaded with fiber, protein and calcium. I used Trader Joe’s 10 minute pre-cooked Farro. It’s great because it’s quick and easy, and making it in the electric pressure cooker, you just set the time and can go get ready for the day while it cooks. 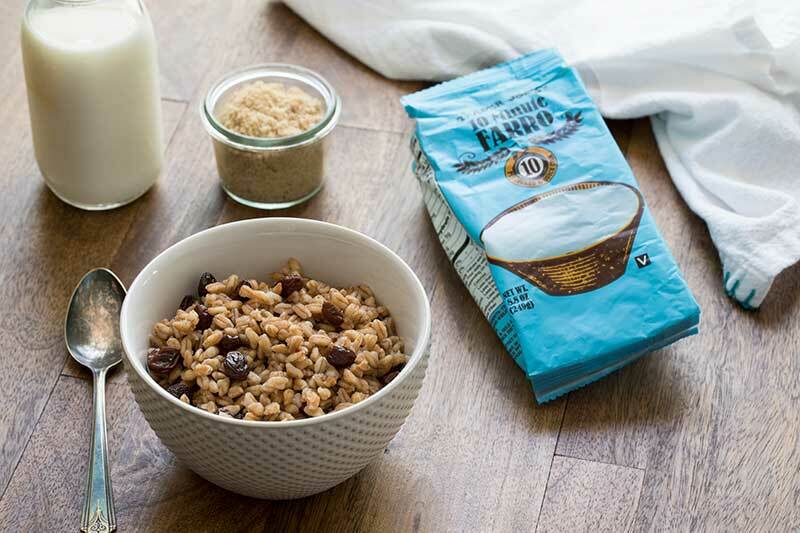 If you don’t have a Trader Joe’s near you, you can also use whole farro. Jill Nussinow in Vegan Under Pressure recommends soaking whole farro overnight and then pressure cooking 1 cup farro in 2 cups water for 20 minutes with a natural pressure release. I froze half of the farro in individual servings so I didn’t have to eat it every day during the week. It reheated really well. Next time I’ll buy two packages and make them both at the same time. I hope you’ll give farro a try and let me know what you think. Select Browning/Sauté and melt butter in the pressure cooking pot. Stir in farro and cook, stirring frequently, until fragrant, about 3 minutes. Add water, raisins, brown sugar, vanilla, cinnamon, and salt. Select High Pressure and 5 minutes cook time. When timer sounds, allow pressure to release naturally for 5 minutes. After 5 minutes, use a quick pressure release. When valve drops, carefully remove lid. Stir mixture. I finally tried this recipe and it was absolutely delicious! It’ll be my new go-to breakfast, I can cook up a batch and eat it during the week for breakfast. It would make a nice dessert too, the flavor is so yummy. That’s great – thanks Sheila! When I make something like Farro or steal cut oats the recipes usually make 4 to 6 servings. I live alone and that amount usually makes 6 or more servings for me. I freeze it in re-usable muffin liners in a cupcake pan, usually overnight . When it’s frozen solid I dump them in a zip bag and can then take out one at a time. HI. I AM ALREADY SIGNED UP. THERE IS SOMETHING “BOTHERING ME” IN THE INSTRUCTIONS FOR THE FARRO. YOU START OUT WITH THE BROWING/SAUTÉ BUTTON, I AM NOT SURE I HAVE THAT BUT THERE IS A SAUTÉ BUTTON. NO PROBLEM. THEN WHEN YOU ADD THE REST OF THE STUFF AND SEAL IT UP AND COOK FOR FIVE MIN., HI PRESSURE, DO YOU LEAVE IT ON SAUTÉ/BROWNING, COVERED AND SEALED, FOR THOSE FIVE MINUTES? Hi Vilma – no, use a pressure cooking button to pressure cook it on high pressure for 5 minutes. If you have an older Instant Pot you can use the manual button or the pressure cook button on newer Instant Pots and Fagors. If you don’t have a pressure cook button on yours, any of the pressure cooking buttons with a 5 minute cook time will work. Enjoy! I’ve seen farro at the grocery store but never tried it. Now that I know it can be made in the pressure cooker and used for breakfast I’ll look and see what all they have to choose from. Thanks Barbara!